60 years old and it's strawberry transfers were still intact! What I thought was a dress pictured on the pattern was actually separates. Which was awesome. More outfits! Women knew their sewing techniques back in the 50s. Darts, waistbands, and buttons. This pattern uses them all. I know that back in the day your clothes dollar counted so a matching wardrobe made good money sense. I'll bet every little girl had a plain (handmade!) cardigan to round out their outfits. I could learn from that. Awesome pattern! It reminds me that I need to go raid my MIL's patterns to see if she has any oldie but goodie patterns! Totally darling outfit!! What a cute pattern! I really love the shorts from this pattern. 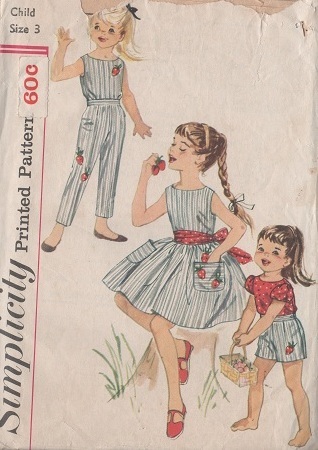 I have a whole slew of vintage patterns from my grandmother, though most of them are dresses my teenagers will likely never desire I make them, but I've made many of the nightgowns and pajamas. They do make it out to look like a dress! I also LOVE the full skirts from that time era! Beautiful pattern and great job on the outfits! What a wonderful pattern - and yes, it really looks like it's a dress with a tied waistband. How clever and practical! And you definitely need a plain cardi to complete the look. This is adorable! I have a serious weakness for vintage patterns - what a great outfit!! I love love love vintage patterns! This one is no exception great job! i love that in the last photo she's wearing two different shoes! That turned out WONDERFUL!! I love the old style, too. Makes little girls look like little girls rather than dressing them in 'too old' of style (not old fashioned, but too 'mature' if you know what I'm saying?!).. Anyway, great outfit!! And great job sewing! !